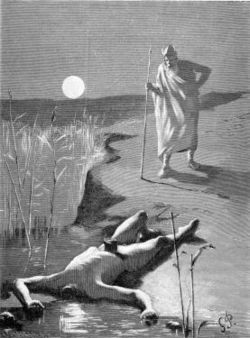 Odin finds Mímir's beheaded body. Mímir was a primal god of Norse mythology renowned for his knowledge and prophetic wisdom, whose name is linguistically related to "memory." Though his origins is uncertain (as he can be tied to both the Aesir and the frost giants), his importance is undisputed, as he plays an integral role at various points in the mythic time line, including Odin's acquisition of prophetic knowledge, the primeval war between the Aesir and the Vanir, and the demise of the current world-order at Ragnarök. The fact that these roles are somewhat mutually incompatible simply provides an intriguing hint of the gradual process of synthesis and accretion that must have occurred as these mythic traditions were collected and recorded. As a Norse deity, Mímir belonged to a complex religious, mythological and cosmological belief system shared by the Scandinavian and Germanic peoples. This mythological tradition, of which the Scandinavian (and particularly Icelandic) sub-groups are best preserved, developed in the period from the first manifestations of religious and material culture in approximately 1000 B.C.E., until the Christianization of the area, a process that occurred primarily from 900-1200 C.E. The tales recorded within this mythological corpus tend to exemplify a unified cultural focus on physical prowess and military might. Within this framework, Norse cosmology postulates three separate "clans" of deities: The Aesir, the Vanir, and the Jotun. The distinction between Aesir and Vanir is relative, for the two are said to have made peace, exchanged hostages, intermarried, and reigned together after a prolonged war. In fact, the most major divergence between the two groups is in their respective areas of influence, with the Aesir representing war and conquest, and the Vanir representing exploration, fertility, and wealth. More specifically, Georges Dumézil, one of the foremost authorities on the Norse tradition and a noted comparitivist, argues quite persuasively that the Aesir/Vanir distinction is a component of a larger triadic division (between ruler gods, warrior gods, and gods of agriculture and commerce) that is echoed among the Indo-European cosmologies (from Vedic India, through Rome and into the Germanic North). Further, he notes that this distinction conforms to patterns of social organization found in all of these societies. The Jotun, on the other hand, are seen as a generally malefic (though wise) race of giants who represented the primary adversaries of the Aesir and Vanir. Mímir, through his ambiguous relationship to both the Aesir and the Jotun, reflects the fluidity of the Norse pantheon, at least with respect to the categorization of secondary deities. However, the god's association with knowledge and prophetic wisdom remains constant, despite this lack of an explicit characterization. The profound connection between Mímir and omniscient, prophetic knowledge is evidenced in the the Prose Edda written by the twelfth century Icelandic historian Snorri Sturluson. In it, he describes the deity as the caretaker of the Well of Knowledge, controlling access to its wisdom-imparting bounty. Given that the well is located under one of the world tree's roots in the realm of the giants, it is reasonable to conclude that, at least in this iteration, Mímir is of their stock. From Valfather's wage. | Wit ye yet, or what? The conceptual affiliation between the god of Wisdom and Yggdrasill was so potent that one common poetic kenning for the latter is Mímameidr (literally, "tree of Mímir"). Another important mythic tale that features Mímir is the account of the primeval conflict between the two pantheons of deities in the Norse cosmos, the Aesir and the Vanir. In this battle, the god of wisdom plays the role of official hostage. Once the warring tribes of deities realized that their conflict was becoming a punishing war of attrition between evenly matched armies, they realized that a truce was in order. To conclude their negotiations, both sides agreed to exchange hostages, as a guarantee that the terms of the peace would be adhered to. (It is important to note the ubiquity of this practice in Viking times, where "persons [were often] exchanged as surety for various kinds of agreements and were ordinarily not mistreated.") In keeping with the terms of their agreement, the Vanir dispatched some of their most prized citizens (including Njord, Freyr, and Freyja) to take up residence among the Aesir. In contrast, the other group sent Mímir (a legitimately powerful being with tremendous wisdom) and Hœnir (a useless sycophant who relied on his fellow hostage to make the smallest decisions for him). Discovering this deception, the furious Vanir executed Mímir and sent his severed head to Odin as a sign of their displeasure. Upon receiving it, the All-Father "took the head, smeared it with herbs so that it should not rot, and sang incantations over it. Thereby. he gave it the power that it spoke to him, and discovered to him many secrets." After this point, Odin came to rely on the reanimated oracle in making many important decisions. Strangely, all accounts concerning the well of Mímir seem to cast him as a giant, while any account describing Mímir's head depicts him as one of the Aesir (given that his decapitation was the result of the hostage exchange between the clans of gods). Intriguingly, the direction opposition between these conflicting accounts can be seen within a single source—in the description of Ragnarök found in Snorri Sturluson's Prose Edda. Within it, one section suggests that "Odin shall ride to Mímir's Well, and take counsel of Mímir for himself and his host," while later stating that "Odin communes | with Mímir's head." As can be seen, both traditions evidently existed contemporaneously. Despite this discrepancy, however, it is notable that Mímir is always associated with wisdom and the provision of shrewd council. Thus, it seems reasonable to assume that these differences are simply the result of a mythic tradition that developed through centuries of oral transmission. As Lindow notes when exploring the characterization of Mímir, it is quite possible that "we may be dealing with a conflation of figures and conceptions." ↑ Snorri Sturluson, Gylfaginning XV, (Brodeur 27). ↑ Poetic Edda, , "Völuspá" (21-24). Retrieved April 20, 2007. ↑ ONline Medieval and Classical Library, (4), Ynglinga Saga. Retrieved April 20, 2007. ↑ Poetic Edda, "Sigridfumol" (14). Retrieved April 16, 2008. ↑ Poetic Edda, "Völuspá" (47). Retrieved April 16, 2008. ↑ Snorri Sturluson, Gylfaginning (LI), (Brodeur, 79-80). Munch, P. A. Norse Mythology: Legends of Gods and Heroes. New York: The American-Scandinavian foundation, 1926. This page was last modified on 16 April 2008, at 22:51.